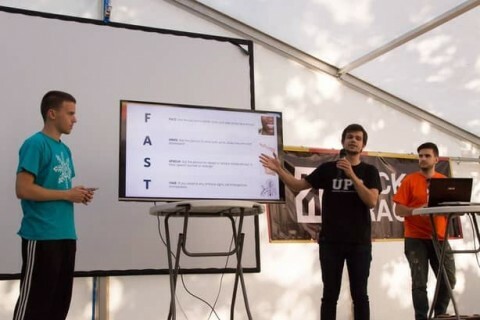 During the weekend of June 17 and 18 the first edition of the HackPrague took place and of course, some members of the inLab could not miss. The group formed by Eduard Maura, Juan Salmerón, Sergio Paredes, Juan José Vázquez and Marc Vila traveled on Thursday of the same week to the capital of the Czech Republic to attend this event. The HackPrague is a new hackathon and is not affiliated with the Major League of Hacking (MLH), but functions as an independent event and, therefore, its participation is not restricted to students only. Hosted in the K10 Coworking site, the event offered a hacking environment where we had a garden, our own kitchen with catering and self-service and even sauna. Technological giants such as Google, Facebook, Bloomberg, Avast and JetBrains were some of the sponsors that sponsored this event and presented challenges to the participants. Marc Vila and Juan Salmerón developed McTrack Advertising, a dynamic and intelligent advertising system based on the history of detections of wireless devices. The system detects these devices and stores them together with the descriptions of establishments close to detection, using the Google Places API and Firebase. The system analyzes the behavior of the device to extract a profile. In the advertising panels nearby devices are detected and, in this way, personalized advertising can be offered according to the profile of the people close to the advertising space. Eduard, Sergio and Juan José Vázquez Giménez built a mobile application for Android using Kotlin and the Google cloud. The application, developed under the name of IctusDetection, offered a system of detection and prevention of strokes using analysis tools and sensors present smartphones. This project was awarded by Bloomberg with the Coolest Tech Prize and by JetBrains with the Let 's Program in Kotler! Prize, two of the challenges proposed by the sponsors. In addition, Marc Vila participated in the Bloomberg challenge that consisted of solving a series of computer problems. He finished fourth in the standings and was rewarded with a toy missile.